Historically a niche market with many specialized lenders, the reverse mortgage industry is experiencing new challenges to growth in the form of regulatory changes and other market factors. Despite an undisputed surge in the prospective borrower demographic in the coming years, lenders are seeking new ways to tap into this potential market. One potential key to success: a relatively new term coined Generational Lending. The concept was reintroduced this week by leaders from industry software provider ReverseVision during the company’s annual UserCon conference in San Diego. 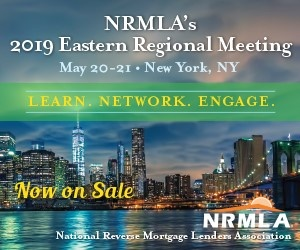 Attracting originators and other mortgage market participants both experienced and brand new to reverse mortgages, the conference opened by proposing new ways for loan originators to serve multiple generations by offering a full suite of products—geared both toward forward and reverse mortgage borrowers. “If you have a borrower, why not meet them where they are in the borrowing spectrum?” said ReverseVision VP of Sales and Marketing Wendy Peel, of the concept. The idea applies to originators whose former forward mortgage customers can benefit from a reverse mortgage later in life. Or, it can apply in a contrary scenario for reverse mortgage originators who may be able to gain customers in the adult children of reverse mortgage borrowers. But there are also entire databases of customers of large banks and other mortgage companies that have prospective borrowers but do not offer reverse mortgages. In fact, many lenders are becoming more specialized and increasingly they are independent mortgage companies rather than banks. According to recent survey research presented Wednesday by Jim Cameron, senior partner for mortgage consulting and research firm STRATMOR Group, 6% of reverse mortgage lenders are bank affiliated, compared with 49% of forward lenders. Most that offer reverse mortgage also offer forward mortgages, according to the findings, and among the forward home loans originated in 2016, thousands were for homeowners 62 or older—many of whom could have used a reverse mortgage more effectively to meet their goals. As the leading reverse mortgage origination software provider, ReverseVision is doing its part to approach the growth challenge head on. In discussing goals for the coming months and years, the company says it is working to enable generational lending and to expand on its products plan to meet the industry’s needs in terms of where it is going. In addition to work on reporting framework, data security protections, faster document generation and expanded loan data import capability, ReverseVision’s product team says it is making updates with flexibility in mind.